In this post, we analyse whether there has been enough finance to enable productive investment? This question was posed to the Bank of England by the Government last year, as part of its ‘productivity plan’. One concern is: Is the financial sector is holding back UK productivity? This post summarises our own insights on this topic, partly drawing on the recent Bank Discussion Paper. Importantly, our interpretation is blurred by the lack of data. But let’s start with the really interesting things we uncovered. (Q1) Are there unexploited productive investment opportunities in the UK? We found no conclusive evidence of investment deficiency. We think of investment as productive as long as the expected marginal social return to investment is greater than or equal to the expected marginal social cost of capital. Simply put, this means what society as a whole gets out of investment is more than what it puts in. Building a bridge that is heavily used is a productive investment, but a ‘bridge to nowhere’ would be an unproductive investment. 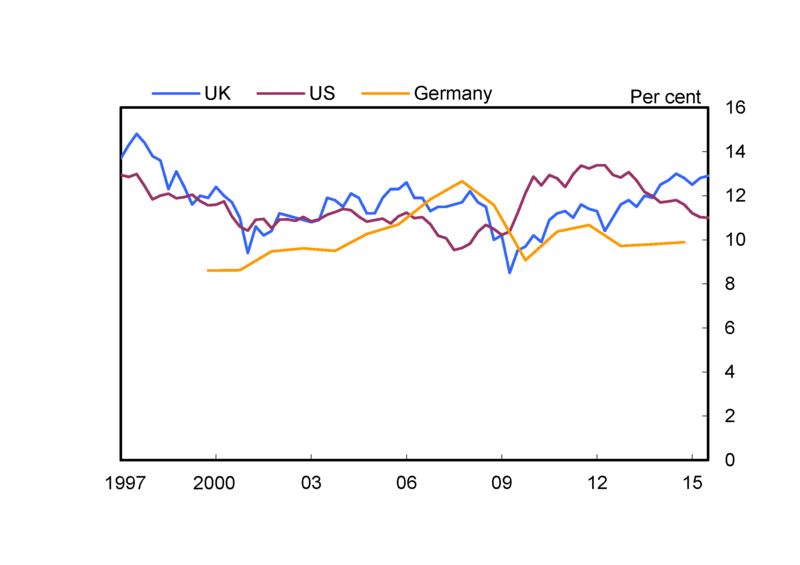 The UK capital stock is low relative to other countries (see Chart 1). If we went out today and burned down every building, scrapped every bit of machinery and fried every hard drive, the cost of replacing all that stuff (lucky for us) would be cheaper as a share of the economy in the UK than for other developed countries. A possible reason for this finding is that the financial system is not giving the funds that firms need to buy new equipment. But there are other alternative explanations as well – the UK has a more flexible labour market which may make it more labour intensive (companies go for workers over machines); and the UK economy is more service oriented, associated with less on machines and more on intangible capital such as software, data and intellectual property. It is well known (e.g. see The Conference Board) that official measures of the capital stock are generally less good at measuring intangible capital than they are at measuring tangible capital. Another way of testing if the UK is investing too little – and leaving productive investment opportunities on the table – is to look at the actual returns on capital. Typically the more machines a company has, the less return the company gets out of adding a new machine (diminishing marginal returns to scale). The UK returns to capital paint a more sanguine picture: UK returns to capital at around 12% are bang in line with its peers – Chart 2 – suggesting no obvious underinvestment in the UK. These data aren’t perfect, however. The social return to capital has been proxied by the private return, the marginal return by the average return, and the expected return by past actual returns. Sources: Centre for International Data, ONS and Bank of England. (a) UK data for 2012-2014 updated using Bank of England estimates (see Oulton and Wallis (2015)). 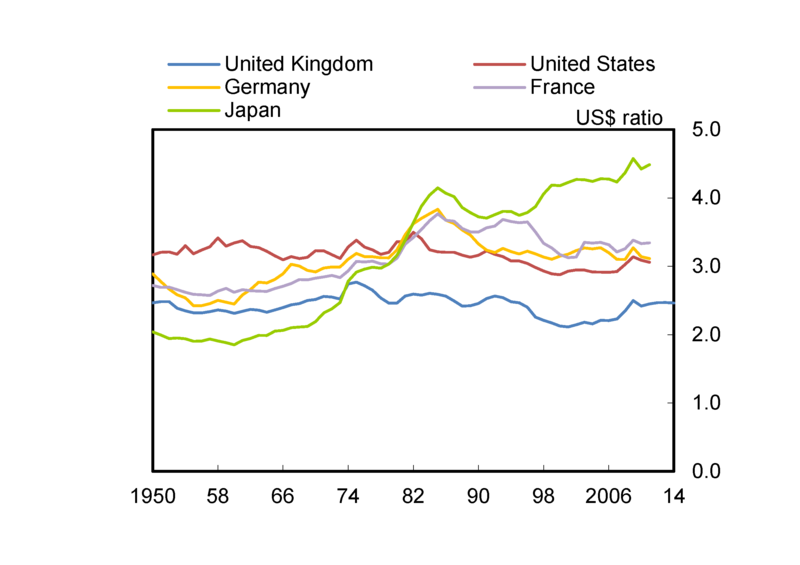 Capital to output ratio is the total economy capital stock (at replacement cost) over GDP. Chart 2 Net return on capital at replacement cost. Sources: ONS. Destatis, BEA. 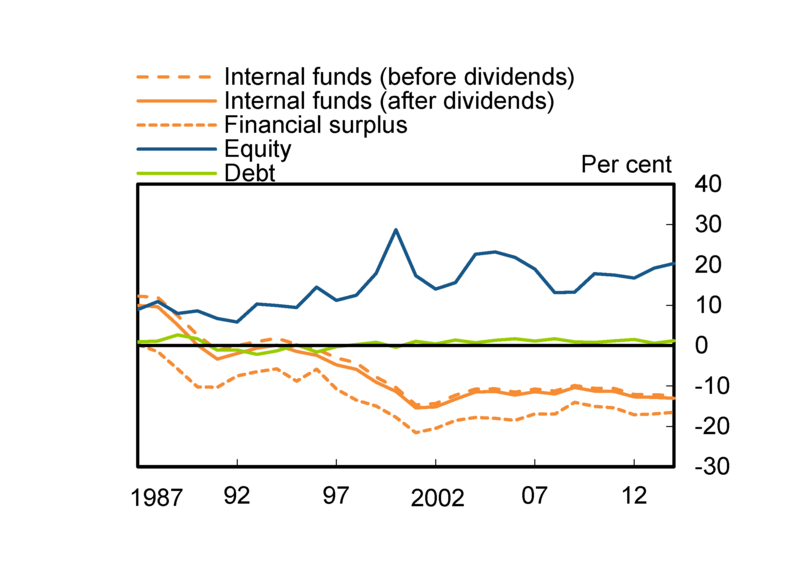 Non-financial corporations’ net operating surplus/net capital stock. The real question of interest here is if investment is low, is the blockage that is stopping investment taking place due to real economy factors – such as globalisation and secular stagnation – or financial factors – such as a lack of access to finance. 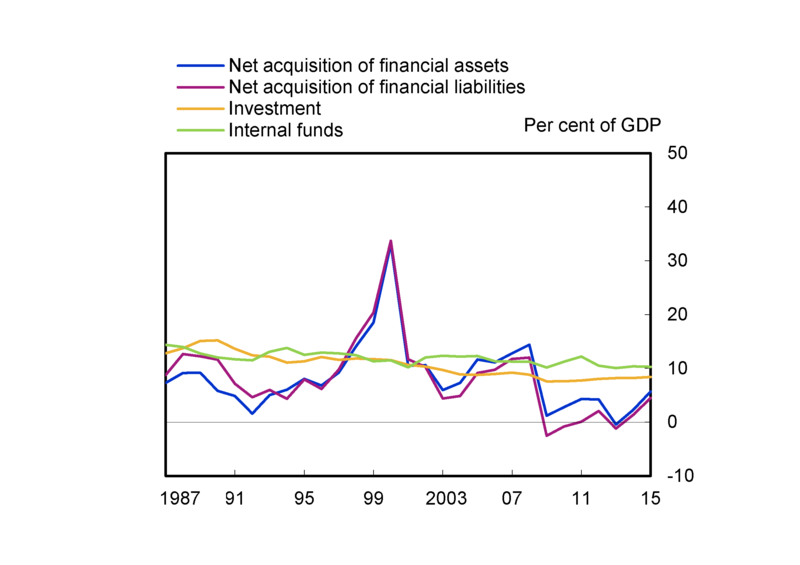 The UK non-financial corporate sector as a whole appears to have enough internal funds to cover all their investment. This can be seen from the green line being above the yellow line in Chart 3. In fact, the corporate sector has become a net provider of funds to other sectors in recent times – it generates and retains more profit than it invests. (A point also made in a previous blog – Are firms ever going to empty their war chests?). What about the funds raised by corporates? We find that the funds raised vary a lot over time – there are periods of high external finance raised (such as the late 90s), and periods of low finance – but these highs and lows of external finance raised do not generally co-move with the level of investment. Instead finance raised seems to move together with companies’ financial activities (red and blue lines on Chart 3). These financial activities include mergers and acquisitions. But more generally the co-movement of the assets and liabilities side of the corporate balance sheet illustrate the desire of non-financial companies to increasingly behave like financial firms by using the external funds raised to purchase financial assets. What is true for the sector as a whole is not true for all firms. Large firms, with access to bond and stock markets, don’t appear to have problems financing themselves. Small firms that do have access to capital markets rely heavily on net equity issuance to finance their business (Chart 4). But the vast majority of small firms do not have access to market-based finance and are heavily dependent on bank funding or internal funds. Surveys show that small firms’ access to finance remains an issue, but it now affects a smaller proportion of firms than in recent years (Chart 5). Sources: ONS and Bank calculations. 2015 data are up to Q3. Sources: average for listed non-financial SMEs in Thomson Reuters Worldscope/Bank database. Internal funds are: Cash Flow from Operations (exc. items relating to changes in net working capital). And the financial surplus is that less dividends, less capital expenditure (net of disposal of fixed assets), less acquisitions. Sources: Deloitte CFO Survey, FSB Voice of Small Business Index, Bank calculations. 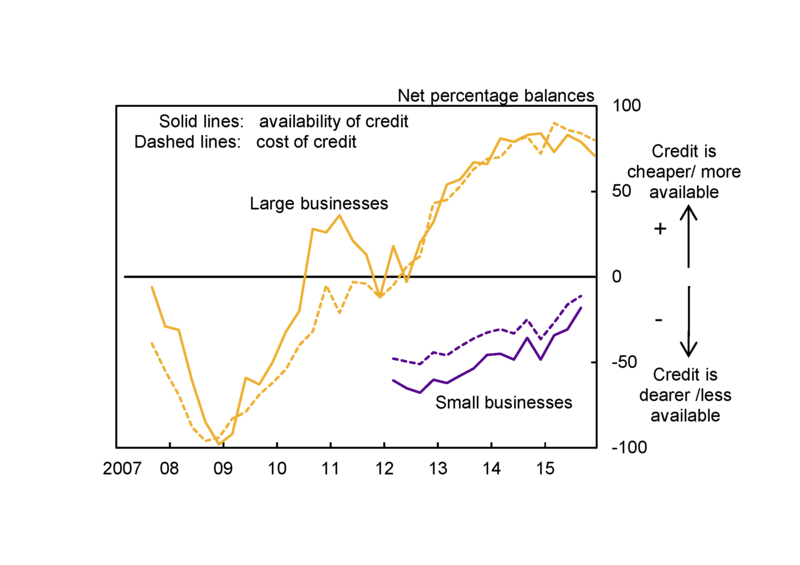 (a) Net percentage balances for the cost (availability) of credit are calculated as the percentage of respondents reporting that bank credit is ‘cheap’ (available) in the Deloitte CFO Survey for large corporates or is ‘good’ in the Federation of Small Businesses’ (FSB) Voice of Small Business Index for small businesses less the percentage reporting that it is ‘costly’ (‘hard to get’) in the Deloitte CFO Survey for large corporates or ‘poor’ in the FSB Voice of Small Business Index for small businesses. One challenge is that the data are not good enough. The conclusions drawn out above are based on rough proxies that are available in the data. But there are a number of important questions that remain unanswered. For example, are firms not investing because their hurdle rates are too high? Are hurdle rates very “sticky”, taking a long time to adjust to the lower nominal interest environment that we are in today? We are also interested in finding out whether what is true for the economy as a whole is true for different segments of the economy. 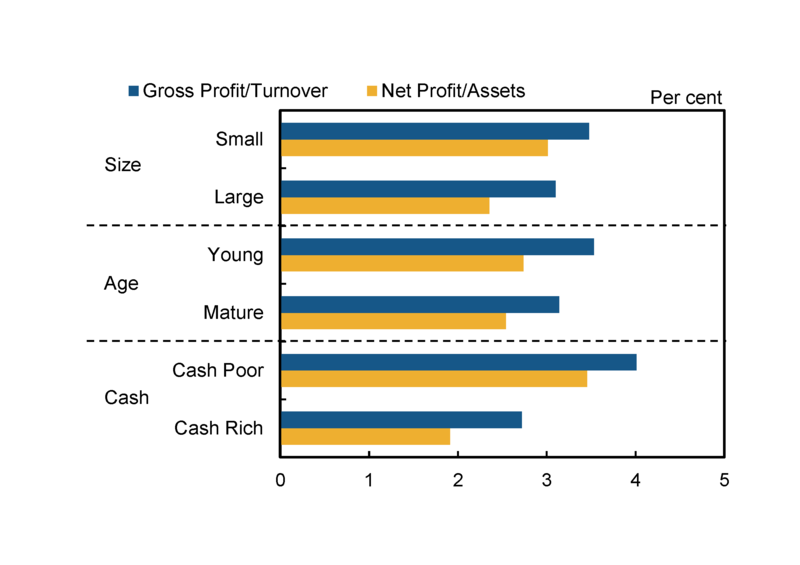 Slicing and dicing the data on returns we find that smaller, younger and cash-poorer firms all had higher rates of return relative to larger, older and cash-rich firms. But the reasons for this are unclear (Chart 6). These higher rates of return could reflect the increased riskiness of such firms, requiring them to generate higher returns to compensate for that risk. Or it could reflect other structural impediments, such as skill shortages or monopoly power. But we just don’t have enough data to make an assessment. Data on the marginal cost of capital for each of these types of firms would allow us to adjudicate between different hypotheses. On measuring finance we know how much finance firms actually have (from their balance sheets). What we don’t know is how much they could have raised if they wanted to, and at what price. What makes things even more complicated is that getting access to external funding – a bank loan, equity or bond issuance – does not necessarily translate into new investment. In the past firms had raised lots of money, but those funds were used for other activities, such as mergers and acquisitions or stock buybacks (Chart 3). But in other times, such as during the global financial crisis, levels of finance accessible to firms fell sharply, as did investment.The punchline is: money raised by companies is not always a good predictor of investment.What we need is to find out how different types of funds are used and what the funding structure of investment is. For example, what proportion of internal funds is typically used by companies for investment purposes? And does this vary by firm size, age and cash balances? Source: Bahaj, Foulis and Pinter (2016) using Bureau van Dijk data. Notes: Young is at most 5 years old. Small is less than 50 employees. Cash rich is when cash (as defined on the balance sheet) less overdrafts, divided by turnover is greater than the sample median. The median of the variable is presented over 1996-2012 for each group. In an era of big data, we have discovered the presence of big data gaps. These data gaps may have blurred our bottom line: we have not found any conclusive evidence of investment deficiency in the UK; and the corporate sector as a whole appears to have an adequate supply of finance to fund their desired investment activities. But our aim is to gain more precision. We want data that will enable us to build an accurate set of indicators of finance for productive investment. And we want to be able to measure the supply of finance for productive investment at the disaggregate level as well, as our work has uncovered some notable differences in investment and financing decisions in some sectors of the economy. Such measures will make it easier to diagnose if weak investment is due to a deficiency of the financial system or due to real economy blockages. Distinguishing between these is essential to be able to design the most appropriate policy response. This post is a plea to the economic and data community to help us discover and collect new and better data sources to measure the supply of finance that can be used to exploit productive investment opportunities for different segments of firms. We also want to encourage frontier research and new methodologies to help better understand the determinants of finance for productive investment. Saleem Bahaj works in the Bank’s Research Hub, Iren Levina works in the Macro-Financial Risks Division and Jumana Saleheen is Technical Head of Division in the Bank’s Financial Stability Directorate. This is a useful review of fixed capital investment and its financing in the UK, just the kind of post that makes bank underground useful e.g. as a teaching resource. I totally agree the lack of data is a major concern, limiting our understanding of this key issue. But if I may, a few fairly obvious points about the link of the finance sector, to investment and its financing, and to productivity (a) we know that TFP is as or more important than the stock of fixed capital to productivity, so might be worth a follow up on the financial sector and TFP. One important aspect of this is the market for corporate control, the potential for takeover of poorly performing companies. What has happened in the market for corporate control in the UK since 2008 (I suspect much less active than before 2008)? Is this linked to relatively weak productivity growth? (b) the relevance of the discussion credit and credit availability for small firms to fixed capital investment can be challenged. Small firms (and to a major extent large as well) mostly use credit, whether from banks or wholesale markets) to finance working capital and trade finance. despite improvement since 2012 there continue to be in my judgement significant impediments for younger, smaller firms accessing short term credit, and this can be one explanation of the differences in profitability revealed in your chart 6 (the risks involved are largely diversifiable so if the financial sector was working well, higher idionsyncratic risk of smaller firms would NOT explain the higher profit rates). (c) credit availability may be an issue for capital investment for medium sized firms — anecdotal evidnece suggests to me that bond issue by firms employing 50-500 people is problematic in the UK (whereas e.g. in Germany Mittelstand could get at least some medium to long term finance fro their Haus banks) and this may hold back investment and productivity, but as you are aware data limitations make this difficult to investigate (d) going forward I would suggest that a key policy issue will be preparing for the next down turn whenever it comes and ensuring that the (presumably largely cyclical) improvement in access/ pricing of external credit for small firms revealed in your chart 5, is not then reversed. One promising development that merits attention is fintech and non-bank credit e.g. invoice financing, and the extent to which it is overcoming this long standing financing gap. As we have seen, since 2008, many companies are not, Globally, putting their money into or investing into productive assets. Many are simply using this money to buy back their own stocks vs real productive investment. Banks are increasing their deposits on hand with the ECB at low/even negative rates or holding Cash in their own vaults. The growth we have seen is based on Debt, not real productive growth. We are seeing a lot of Malinvestments. Lastly we have entered into Deflation and Deflation is taking hold and will take its toll on Debt and Growth.